Happy New Year! Just to let you know that we are moving this blog to a new City, University of London platform and giving it a brand new look. We would be delighted if you would like to continue reading the blog in the new format and you can subscribe via email by visiting https://blogs.city.ac.uk/citylibresearchers/ and you can subscribe via email at the bottom right hand side of the screen. This site will continue to run in parallel for the new few months. Project Euclid is an online publishing service driven by libraries, publishers and academics in the fields of theoretical and applied mathematics and statistics. It offers access to a growing platform of high-quality, peer-reviewed journals, books and conference proceedings. Improved searching, citation exports, publisher landing pages, mobile optimisation, e-mail alerts, and access indicators for all content. All users have access to table of contents pages and article abstract pages. 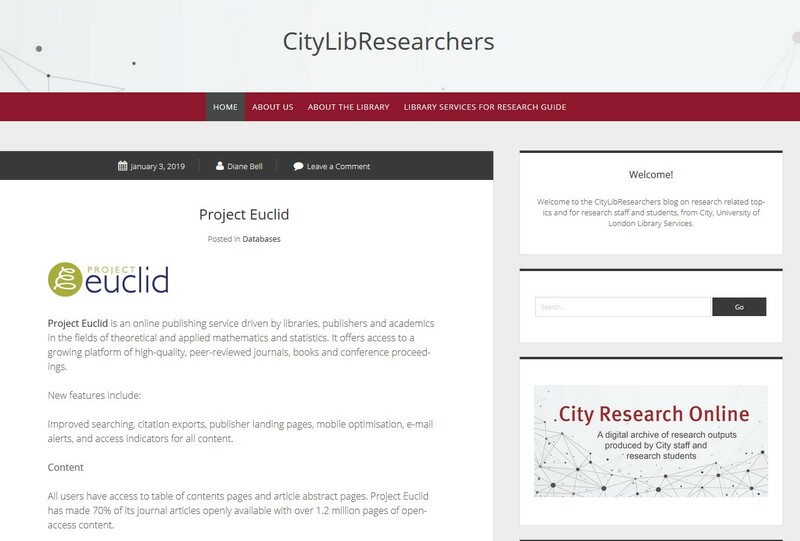 Project Euclid has made 70% of its journal articles openly available with over 1.2 million pages of open-access content. You can browse titles such as the Journal of Applied Mathematics available via CityLibrary’s subscription. Users can register to follow publications by receiving an emailed table of contents when a new issue is published. They can also sign up to new issues or articles of any publication in their RSS feeds. There is a list of feeds for books and journals. Follow Project Euclid on Twitter. The Sunday Times has provided comment and analysis since 1822 both on weekly news and on societal issues in general. City Library Services subscribes to The Sunday Times Digital Archive which provides a complete searchable run of the newspaper from 1822 to 2006. The nineteenth century content has previously not been very accessible and has been largely unexplored but the archive now provides researchers with a large range of social, historic and cultural content and insights. The twentieth and twenty first century content is well known for its investigative approach to journalism and in-depth and well researched stories. It is a great resource which is of general interest and is especially useful for humanities and social sciences courses such as History, Journalism, Politics and Cultural Studies. You can access the Sunday Times Digital Archive directly from the Databases A-Z on the CityLibrary homepage by using your City IT username and password. See also our Newspaper guide for both current and historic newspaper content. LexisLibrary provides a very useful starting off point for those carrying out research into UK law, and it also offers selected sources of material for researching the law of other countries. We are often asked how LexisLibrary differs from Westlaw, and whether legal researchers need to use both LexisLibrary and Westlaw. In short, each database is owned by a different publisher and – whilst there is some overlap in content – each of LexisLibrary and Westlaw contain significant amounts of unique content (e.g. practitioner texts and journals) and it is important that legal researchers consult both databases. It provides access to a large number of full-text UK law reports, including the All England Law Reports. Court judgments are uploaded to LexisLibrary very quickly after they are handed down, and a handy ‘Appeal Tracker’ feature allows you to track the appeal status of significant cases. LexisLibrary allows you to view both current and historical versions of UK Acts of Parliament. You can also track the progress of public Bills using LexisLibrary’s ‘Bill Tracker’ option. Our subscription to LexisLibrary gives City students and staff access to many practitioner works and legal texts. Some LexisLibrary highlights are: Halsbury’s Laws of England (an invaluable starting point for research into both broad-based queries and also more esoteric points of law! ); Harvey on Industrial Relations and Employment law; Clarke Hall & Morrison on Children; Goode: Consumer Credit Law and Practice; and Tolley’s Insolvency Law Service. LexisLibrary allows you to access selected international sources, e.g. cases, legislation and journals from overseas jurisdictions. Lexis have produced a handy guide to help with this. If you are at City and would like to know more about how to get the most from LexisLibrary, you can make an appointment with one of our Law Librarians, and we would be very happy to help! With an ever increasing focus on open access within the academic community, a continually evolving range of online services are available providing unrestricted access to current research articles. These include directories of open access journals and repositories, pre-print server collections of both peer reviewed and non-peer reviewed manuscripts, and aggregating services harvesting open access resources from online platforms across the globe. How do I recognise if it is open access? The open padlock symbol is a universal icon indicating whether an article is open access. Whenever you see this symbol online, you will have free access to the content in which it is embedded. Where can I find open access articles? The platforms listed below are a sample of the online platforms giving unfettered access to scholarly research. CITY RESEARCH ONLINE Repository of City, University of London research papers. CORE Search engine for articles in Open Access repositories and journals worldwide. OPEN ACCESS BUTTON Search engine for articles in Open Access repositories and journals worldwide. UNPAYWALL An open database of 20 million free scholarly articles. DOAJ (Directory of Open Access Journals Directory of Open Access journals worldwide. OpenDOAR Directory of Open Access repositories worldwide. PLOS Open Access journal platform covering Science, Technology and Medicine. bioRxiv Repository of pre-peer reviewed articles for Biology. Preprints A multidisciplinary platform hosting pre-peer reviewed articles. EThOS (British Library) Repository for PhD Theses from UK Universities – Create account for free. In most cases, it takes anywhere between three and five years to write a doctoral thesis and a lot of the content is original research. But until recently, once finished, bound, and the degree has been awarded, the doctoral theses would end up inaccessible to most potential readers. So where are all the theses? At City, the theses would be catalogued and then taken to the library store. The theses would be locked away in this store, which is in the university’s basement, and it would be necessary for them to be requested in advance and brought up to the library by library staff in order for them to be read. Obviously, the potential readers would have to make a trip to the library. But then, in 2011, with the launch of City Research Online, our institutional repository, things changed. The bound theses are still stored in the basement, but electronic copies of the theses are made available through City Research Online. Has it made any difference? A quick scan of the available data shows that in the past 10 years, the most popular print thesis was requested 37 times. This is in stark contrast to the most popular electronic thesis, which was downloaded over 7000 times in just over 5 year period. Our theses have been downloaded by readers across the globe, and I am doubtful that a reader from Estonia or Zimbabwe would take a trip to City to access the print copy. The figures also show that only 48% of our print theses have been requested to be read, whereas all our electronic theses have been downloaded at least once. Even if we assume that those downloaded once only were viewed by a librarian, this figure is still below 2% of all City theses available online. To browse theses in City Research Online, by school or by year, click on the theses icon and discover the amazing knowledge they contain. Creative Commons licenses enable sharing of and access to creative works, such as images, scholarly literature or music. Where can you find works shared using a Creative Commons license?